Place branding is still relatively new, successfully distilling an overarching brand, such as has been done by Durham NC, where I live, is even more rare. Most places still fall into the trap of thinking a brand is just a logo or a catchy tagline or what officials there want or presume it to be rather than something distinctive that can be truly delivered. An authentic brand is a distillation of the almost temporal values, traits and descriptors that are distinctively manifest in the minds of generations of not only its internal stakeholders but also its external audiences. Far too many attempts at defining a place brand seem contrived or incomplete or even misleading and the problems can always be traced back to a flawed process. Some place brands are just inaccurate in the same way that White Rhinos aren’t really white, Australian Shepherds don’t come from Down Under, Sperm Whales weren’t valued for their sperm, Hermit Crabs don’t live alone, Guinea Pigs don’t come from Guinea, Oystercatchers only rarely eat oysters and Flying Lemurs aren’t lemurs at all. Various road trips over the nearly three years since I retired have taken me through 40 of the 50 states in the USA, crisscrossing many via multiple routes. This is pretty impressive for someone who hated to travel during a nearly 40-year career in marketing communities as destinations for visitors. Through a windshield it is easy to see why geography isn’t a very good way to brand or summarize the personality of any state because each one offers such a variety of landscapes and terrain. Taking that approach is likely to result only in a stigma. States are not usually destinations anyway. Instead, they are a means of narrowing down a route or a specific destination town or city. But how a state is branded, both in communications and in terms of being litter and billboard-free, can enhance or destroy first and last impressions. An effective place brand must be reinforced at every touch point. 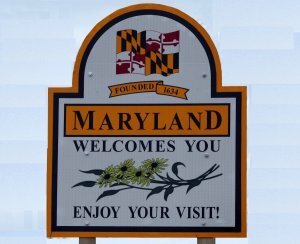 The State of Maryland even appears to tweak the hue of yellow used on roadway signs and markings there to resemble the shade of yellow in its welcome signs and on its state flag which are drawn from a part of the state’s seal. Officials there swear that isn’t the case. Maybe its just a dab fluorescence, but the change was very noticeable, to me at least, as I have traveled across state lines into and out of Maryland from adjoining states on six different occasions. State seals and flags are notoriously poor designs for large scale use but Maryland, since the Civil War, has not only extracted an element that is scalable, but made it an overarching brand signature for the state including the University of Maryland. If you are wondering what “every touch point” means, the appearance that Maryland seems to tweak the standard yellow used on roadways and signs is a good example, even if only perceived. As for Baltimore Orioles, whose sweet sound heralds spring throughout much of the Eastern half of United States including where I live in North Carolina, they are not named for the city or the baseball team but because some believe the species exhibits a bright color similar to that in the crest of Lord Baltimore, the first Proprietor of Maryland. On the other hand, some may find in the name a reminder of something I once read entitled Why Men Love Red but Wear Brown! One of the important aspect of web marketing is to make sure that the landing URL is right. In an effort to make sure that content is good and worthy of stay, bloggers tend to forget to rewrite the URLS, making it difficult to remember should a user take interest. I think the touchpoint principle is what marketers should really start focusing on again. It would greatly help online and offline marketers get sales if clients patronize them because of a touch point that they effectively convey. Totally valid argument. A lot of people seem to forget the 'distinctive delivery" point since they're so used to taglines and that sort of talk. They should really make use of whatever they have and put it in whatever marketing tactic available, like an online quiz contest on the facebook page or something to that effect.